Although there are dangers involved in ruminating on who actually invented the electric violin, discovering all about Hugo Benioff's ideas and inventions is possibly of paramount importance in coming to any conclusions about the origins of electric violin. Hugo Benioff did not live to see his electric violin, electric cello or electric piano reach a manufactured stage and to date there is still no commercially made Benioff musical instrument. There is evidence that Benioff made or had them made and that they were played, by Benioff and others from the musical profession in the area where he lived. There is also compelling fact that directly link Benioff's work with electric violins being manufactured on a fairly large scale today. For over seven decades scraps of photographic evidence of a Benioff violin and cello have lain dormant in the back catalogue of the Popular Science Monthly magazine. The first maybe, published in September 1938 and possibly the second in November 1946. The actual instruments though are more worryingly probably lost. 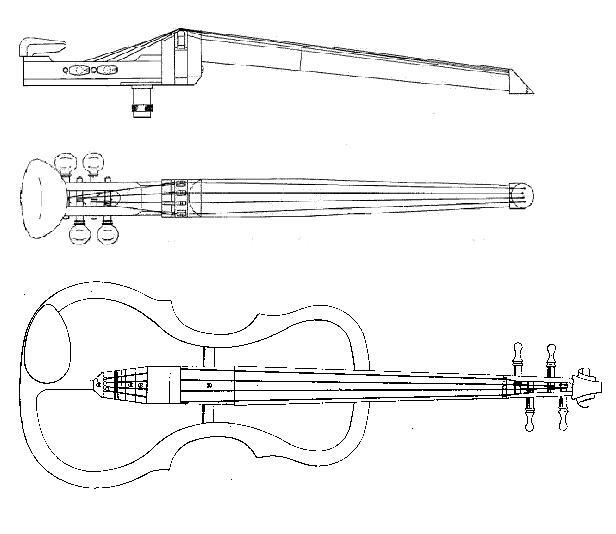 The line drawings reproduced here are from the issued patent specifications, with the customary annotations removed; these are essentially the better known images of Benioff's violins. The most crucial question therefore, surrounding Benioff as a musical instrument inventor, developer or maker of any worth is unanswerable. That is of course, until something yet more tangible can be found or replicated. If you are not a Geologist, Seismographer or Geophysicist you probably do not know of Benioff's work. Hugo Benioff was born in California, September 14th 1899; and for his work and discovery has a phenomena of this planet named after him - the Benioff Zone. The brilliance of his work as a Scientist is documented and not in doubt, though he died aged 69 before any significant interest in his lesser-known musical work was aroused. This may be because he never completed a perfected musical instrument; that his musical work was done in his spare time; or maybe because he was a scientist, the musical establishment and world at large did not notice his work towards an effectively electrified violin. From his first published papers in the early 1930s, Benioff's name has been synonymous with seismography. He invented a seismometer and strain gauge, both became established in the field. Benioff has helped develop our knowledge and understanding of vibration, right across a large range - from the slow and devastating pulses created by earthquakes to the faster vibrations in music and even to ultra-sonics involved in submarine sound-signalling. It should come as no surprise that someone so interested and gifted in observing, recording and studying vibration is found to have included as part of their output the creation of musical instruments. There is no question Benioff succeeded in many ways. His name is honourably attached to work that continues to contribute to the world of science. Just as Stroh and Parsons before him were great engineers who also turned their thinking to violin and musical instrument making, so did Benioff. In this respect he stands apart from nearly all of the other originators of the electric violin. He developed a method of electrifying stringed instruments that is still relevant today and as such is found referenced in records relating to the most current, contemporary and globally commercially successful companies manufacturing pickups and instruments for the complete family of electric violins. Significantly, Yamaha, Fishman and Baggs each cite Benioff's inventions in their granted patent specifications, yet Benioff died before any of these companies had begun work on electrifying violins. Living memory questions whether Benioff actually completed his work. There was no Corporation or Company set up for any of his instruments, musicians were invited to play his instruments in the privacy of his own home. According to press Benioff's electric cello was played in a concert by the cellist Stephen De'ak, possibly meeting Benioff after he joined the University of Southern California in 1943. This may have been the only public performance given using his instruments during Benioff's life-time. Benioff's musical instruments are at best, known in connection to the Baldwin Piano Company and to the internationally reknowned concert pianist Roselyn Tureck. In October 1941, Benioff as inventor and assignor to the Baldwin Company filed for an invention for what he called a Piano String Support. A month later he applied for a Transducer for Stringed Musical Instruments invention. Over twenty years later Benioff was still working on his piano inventions in connection with Baldwin and in August 1962 he secured rights for his last invention, an Electro Piano. Four years later, two inventors Daniel Martin and James Ziegler also assigned to the Baldwin Company, filed for an invention (3,470,305) relating to improvements made to Benioff's Electro Piano. Martin and Ziegler were granted this patent a year after Benioff died. In it they use Benioff's term to describe the instrument and make detailed reference to the considerable improvements Benioff achieved in electrifying a piano successfully. In addition to this tangible support and belief, Roselyn Tureck a brilliant pianist who may have been the only player directly encouraging and helping in Benioff's endeavours spoke of his work in very high regard. Towards the end of her life, when she was living in Oxford she spoke of Benioff as being on the verge of having invented a new instrument and a real progression in piano invention. The expectation had been that Baldwin would go on to manufacture the Benioff Electro Piano, but the instrument it appears they subsequently made does not carry Benioff's name, and how much of the instrument was true to his ideas is not yet known. It is more unfortunate that Benioff's surviving family have no idea where any of the original musical instruments are nowadays. It is presumed that they form part or parts of an academic collection somewhere. The violin is a musical instrument that has gradually developed in every way to make best the manner in which the strings vibrate audible; be reliable to hold the tension of these strings; and not to negatively disturb any vibrations demanded by composer and violinist. 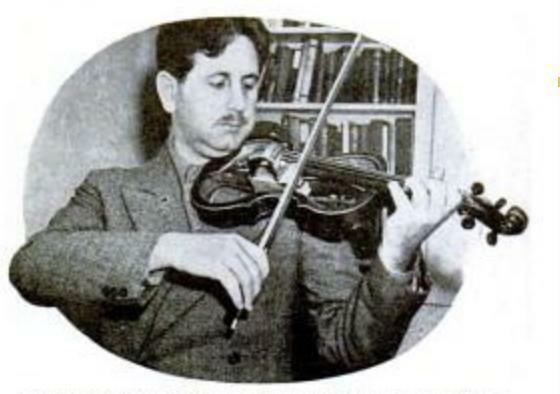 In September 1938, Hugo Benioff was reported in the New York Times as being the inventor of the electric violin. Considering the National VioLectric, the Electro String Instrument Corporation, Vivi-Tone and Allencraft had all begun marketing their own brands of electric violin, even if just by a few years this claim of invention appears spurious. However, the article describes how studying seismographs of earthquakes, Benioff was inspired by the gyrations to attach meteorological equipment to musical instruments. From this inspiration came an electric violin, cello and piano. The article gave news of Benioff inviting some of his associates at the California Institute of Technology to a concert given by an all electric orchestra. The success was such that the institute soon planned to establish a center of such research. The instrument is described in the newspaper article as being similar to the traditional violin but with back and sides missing. The pickup device is described as being a small metal box containing a crystal and working by the piezo effect of vibration registered as an electrical charge. As a description, this bears resemblance to at least one other back and sideless violin from the same period, the Vivi-Tone electric violin by Loar. Lloyd Loar was already known in the musical world and had been a chief engineer at the Gibson Guitar company by the late 1930s. From the information in the newspaper article Benioff is said to have been inspired to start work in 1930. However, from noting the nature and potential application of his inventions filed in the mid to late 1920s, it is possible that his work towards an electric violin started before the earlier granted patents belonging to Beauchamp, Pfeil and others. Benioff did not start out his work as a musical instrument maker by straight-away claiming the invention of a new violin. In a later article published in the Los Angeles Times reference is made suggesting Benioff may have certainly begun one of his bowed stringed instrument inventions in 1928. He worked the entire system gradually, almost from scratch and his work began with electronics and amplification, leading to the actual instrument. His was not just a new violin body design with a pickup attached, he came around to imagining the whole instrument, including exactly how and why it works. That his invention came nearly ten years after John Compton's attachable pickup device and some eight years after Victor Pfeil's work has potentially disguised the fact that Benioff's work was thorough and toiled over for decades, maybe starting before and certainly lasting years longer than the better cited inventors of the electric violin. In any case, his is a definite point of interest and of clear significance amongst a handful of other electric violin inventions. Only four months after applying for his first violin patent, Benioff presented a redesigned and re-worked Electro violin. This instrument has many more traditional reference features such as a "normal" scroll and peg-box and a complete body outline. Likely then that the 1938 New York Times article was describing his second not first violin invention. This re-working is found in the work of other makers of this earliest period and can probably be attributed to the maker's reaction to player comments about their experiences playing these new violins. Benioff may well have been in contact with, known or knew of the work of any number of the better known and commecrcially succssful electric violin makers of this early period. He was based in California during the 1930s and it is not implausible to think that maybe there is more yet to be said on Benioff's grandly titled "Seismographic fiddle". The following are references, samples and transcripts of some of the known articles and probably all patented inventions relating to Benioff and are presented in chronolgoical order. Any issues over inclusion here should please be raised with the Author immediately by email. The Operating Frequency of Regenerative Oscillatory Systems by Benioff, H.
When is a 'cello better than a 'cello? The answer may be "When Dr. Hugo Benioff associate professor of seismology at the California Institute of Technology designs it." Dr. Benioff, after eight years of research has developed a variety of unique instruments said to have a power and richness of tone heretofore unequalled. Such interest has been aroused in Dr. Benioff's researches that Caltech hopes to establish a center for such [?research?] in the near future, it was said. Dr. Benioff's violin and 'cello possess the same outlines as the conventional instruments, except that the wooden front and back are omitted. In place of the wooden resonance chambers a small aluminum container is installed beneath the strings. In the case of the 'cello the container holds a small piece of crystal. Vibrations from the strings distort the crystal causing it to vibrate and generate minute electrical currents. A wire carries these currents to amplifying devices and thence to an especially developed loudspeaker which reproduces the music with an unprecedented clarity and depth of tone, it was said. In Dr. Benioff's violin a slightly different principle is used. In place of the crystal there is an electro-magnetic device. When a string vibrates io the magnetic field of this device, a current is produced which is amplified and reproduced on the loud speaker. Some musicians have expressed to Dr. Benioff the fear that the revolutionary instrument may reduce work available for musicians, since it is said that four persons playing these electric instruments can produce music formerly requiring a dozen instruments. Other musician who have been consulted believe that the new instruments will for the first time make possible satisfactory volume for solo instruments in the largest auditoriums. Particular improvement in tone is said to be notable in the highest and lowest notes, which are asserted to be more clear and rounded than has ever before been possible. Dr. Benioff previously has won recognition as the designer of the most sensitive types of sesimographs, the machines used in detecting the recording earthquakes. The instruments will be demonstrated tonight in a private recital in Culbertson Hall at 8.30pm. Artists will be Peter mere Blum; violin; Nicholas Ochi-Albi, 'cello; and Emanuel Bay, piano. Admission is by invitation only. A violin and a 'cello without resonance chambers last night were heard in an experimental recital in Culbertson Hall, California Institute of Technology. The instruments were aof an electri-mechanical type developed by Dr. Hugo Benioff, seismologist, over a period of eight years. Proceeding faultlessly through a brilliant program, Peter Meremblum, violinist, Nicholas Ochi-Albi, 'cellist and Emmanuel Bay, pianist, were enthusiastically applauded by the audience of nearly 300. Principal differences noted by the novice between these instruments and the conventional ones were: The violin has astonishing volume in the high notes and a fuller, 'cello-like quality in the low notes; the 'cello was principally notable for an unusual "roundness" and mellowness with almost organ-like quality in the low notes. Dr. Benioff was introduced at the beginning of the program by Dr. Robert A. Millikan, president of the institution, who explained briefly the principles of Dr. Benioff's remarkable instruments. At the conclusion of the program Dr. Benioff at first modestly refused to go on to the stage to take a bow; but the musicians insisted. When he appeared, he was given a great ovation. An earthquake helped to create a new type of violin, the invention of Dr. Hugo Benioff, Associate Professor of Seismology at the California Institute of Technology, that is said to have astounded musicians by the depth, volume and clarity of its tones. After eight years of research with his seismographic fiddle and other string instruments, Dr. Benioff toady invited some of his associates to a concert in which the orchestra consisted exclusively of earthquake-born instruments. The idea behind the new-type instruments came to Dr. Benioff as he watched the gyrations of a seismograph during an earthquake. Both earthquakes and music, he knew, consisted of vibrations. In his spare time he applied the principles of the seismograph to several stringed instruments. The success of the venture was such that the institute plans to establish a center of such research in the near future. In the present forms, the violin and cello, for example, have the same outlines as their familiar counterpart, except that the wood fronts and backs are missing, and small aluminium containers beneath the strings substitute for the wood resonance chambers. The container on the cello holds a crystal. Vibrations from the strings distort the crystal, causing it to vibrate and generate electrical current. A wire leads this infinitesimal current to amplifying devices and brings the tones through a special type of loud-speaker. Many of Southern California's leading musicians have tested the new instruments. Without exception, they pronounced Dr. Benioff's inventions superior in tone to the orthodox counterparts. The violin, they said, has a startling new depth, with rich lower tone and clear, rounded high tone of unprecedented degree. Watching a seismograph recording an earthquake gave Dr.Hugo Benioff, Pasadena, Calif., scientist, the idea for a new type of violin whose tone is said to have astounded musicians by reason of its depth, volume and clarity. Knowing that both earthquakes and music consist of vibrations, Dr. Benioff modeled his violin on seismographic principles, producing an instrument with aluminum containers placed below the strings to replace the wood-enclosed air chamber that gives resonance to the conventional violin. The novel earth-quake fiddle, shown in the photograph being played by its invenotr, dispenses with the usual wood backing, making it possible to look right through the instrument. Dr. Hugo Benioff of the seismological staff has recently announced the construction of a cello and a violin without the conventional resonance chamber. By converting sound waves into electrical waves and amplifying them, sending them out again through a loud speaker he is able to get not only greater volume but particularly, new depth and range of tone is also said to be realized. The new development is a result of spare-time work for the last eight years. At a Los Angeles concert this week, Cellist Stephen De'ak pulled his bow lightly across a queer contraption shaped somewhat like a pneumatic drill. With no effort he produced tones large enough to fill the hall. The gadget, called an electro-cello, was the latest of scientists' attempts to improve on the aged wood and fine Italian hand of the old violin makers. It was fashioned by Caltech's seismologist Dr. Hugo Benioff, who gave up violin playing as a boy because he couldn't stand the noise he made. Eighteen years ago, when he was designing seismographs to measure earthquakes, he decided that there wasn't much difference between a seismograph and a fiddle "except one deals with slow movements and the other with rapid movements." For his scientific cello he mounted a conventional fingerboard and electrified bridge on a heavy wooden frame and stood the whole thing on a metal peg leg. Instead of tones, Dr. Benioff's cello produces electrical impulses which are transmitted to loudspeakers. It has a wider range than a standard cello, but not the deep brown tone. Cellists who are used to the old jokes about struggling into subways with their bulky instruments will find the electro-cello no better. It weighs 50 lbs. and requires enough amplifying equipment to load a small truck. Hugo Benioff - California Institute of Technology, scientist, whose electrocello will be played by Stephen De'ak at his Bovard Auditorium, S.C., concert tomorrow night. Considered as a new type of instrument with a more uniform timbre throughout, deeper and higher tones than those of the conventional cello, it was developed by Dr. Hugo Benioff of the California Institute of Technology after 18 years of research. "No sound is produced by the strings" explained the inventor "but vibrations actuate electrical current to produce the amplified tones." Tiny crystals replace the traditional wooden sound box in a new electrical cello. A musician plays it in the usual way, but produces more sound with less effort - and over a wider tone range. The vibration of the strings distorts crystals attached beneath. As these alternately expand and contract they produce a variable voltage current. Amplified, this is transformed into sound by loudspeakers. The new instrument was invented by Dr. Hugo Benioff, California Institute of Technology seismologist. He says that both cellos and seismographs deal with vibrations - one type fast, the other slow. [pic1] Current from electro-cello is divided into three frequency groups: 40-300, 300-3000, and 3000-14000 cycles. A separate loudspeaker turns each group into sound. [pic2] Cantilvere aluminium bridge bends under string vibrations, transmits pressure to crystals. [pic3] Dr. Benioff plays his invention. Heavily built of maple to confine vibration to strings, instrument weighs 25 pounds.